Pictured left to right: Ana Habib, marketing lead for Latin America, and Katera Ryan, administrative lead for the Regional Municipality of Wood Buffalo. Even serial innovators need a bit of help from time to time. And Jeremy Leonard is the first to admit it. 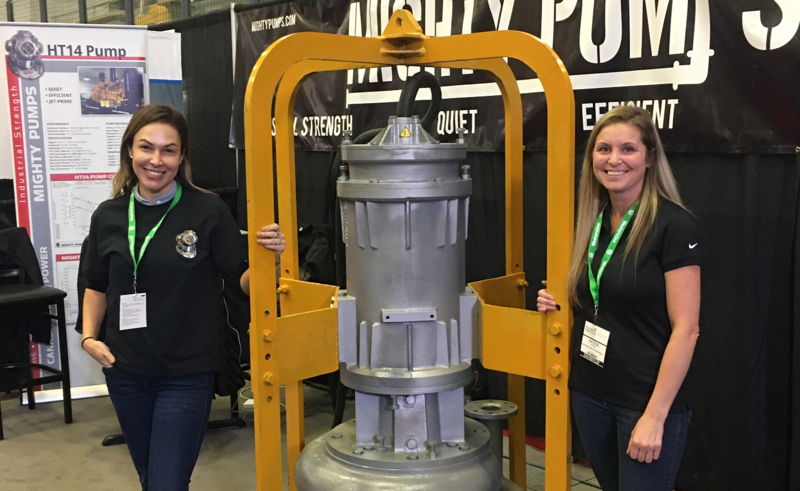 The Fort McMurray native has been the driving force behind successful service companies in the industrial marine sector as well as a designer of innovative equipment for pumping, dredging and diving that is reaching markets worldwide. Innovation is at the heart of Canada Pump and Power (CPP) Corporation, Leonard’s newest venture. Founded in 2010, it employs about 100 people and is based in Ardrossan, Alberta. CPP is known for its Mighty line of pumps, barges and dredges, all of which are Leonard’s ‘brainchildren’ and all represent a step change over conventional systems. For example, the Mighty Dredge is the world’s only autonomous dredge – essentially an underwater digging robot directed by a computer program. In conventional dredges, personnel are typically on large vessels floating above the dredge. The Mighty Dredge operates 24/7 without human intervention. Not only is the Mighty Dredge safer than a conventional dredge, but it is also more efficient and less expensive. CPP holds two international patents on the Mighty Dredge, an achievement that Leonard is particularly proud of: “The dredge was a real breakthrough where my ideas led to an innovation that was patentable.” Our Micro-Voucher program helped complete patent assessment and filing for one of the Mighty brand products. the Mighty Dredge is the world’s only autonomous dredge – essentially an underwater digging robot directed by a computer. In conventional dredges, personnel are typically on large vessels floating above the dredge. The Mighty Dredge operates 24/7 without human intervention. Innovation continues, or as Leonard says, “we’re always looking for what’s next.” For CPP, what’s next is artificial intelligence. The company is currently working with the Alberta Machine Intelligence Institute to incorporate artificial intelligence into the Mighty Dredge and Mighty Pump. Rather than just follow a program with set rules as the autonomous pump and dredge do now, artificial intelligence will allow the equipment to make fresh decisions based on real-time data. One clear opportunity is cleaning up tailings ponds in Brazil — the focus of new regulations after a huge tailings pond collapse in 2015. CPP has already set up a Brazilian subsidiary, Brasil Pump and Power, in order to capitalize on this business.